Facebook’s first satellite which aims to beam Internet service from Space to rural parts of sub-Saharan Africa is scheduled to blast off September 3 aboard a Falcon 9 rocket. 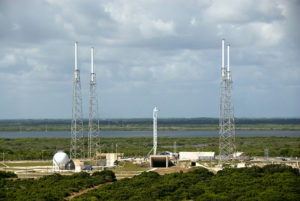 The spacecraft will be launched by Space X, Elon Musk’s space launch company. The launch date, Wednesday, was confirmed by French satellite operator that tweeted the news: the satellite would provide a “powerful new broadband platform”for Eutelsat and Facebook in Africa. Social media giant Facebook and satellite fleet operator Eutelsat have announced the start of their partnership in early October last year. They signed an agreement to pay $95 million over about five years to lease the Ka-band spot-beam broadband capacity on a satellite Amos-6 built by Israel’s Space-Communication Ltd. Known as Spacecom. The satellite Amos-6 has a payload including 36 Ka-band spot beams with a total throughput of 18 gigabits per second. The beams would make Internet service available in 15 African countries. The launch is the next scheduled mission for the Falcon 9 and another chance for Space X to try to land a reusable rocket which is a part of the company’s grand plan to send people to Mars.